Summary : This whole fruit herbal tea from Culinary Teas is a strawberry lovers delight. The tea, once brewed, has a beautiful maroon red color to it and tastes very similar to a strawberry fresh off the vine. Review : Spring is here. Well, sort of. At least it is approaching, however slowly it may seem at times. Unfortunately, I'll have to survive the next week...a massive storm system is coming in and is slated to pound the Sierra's with heavy snow. And Reno won't escape, either...suppose to be cloudy and rainy for the next week. Yuck. Once you get use to the Nevada sun, well, let's just say clouds and rain can be tough to deal with if they linger around too long. So, needing something to brighten up my day, I felt it was time to try a new tea...something I would have no idea what to expect. And so I dug around and came up with a tea sampler from Culinary Teas called Lady Hannah's Whole Fruit Herbal Tea. As you can tell by the name, this is a whole fruit tea. It contains no tea leaves. And my, is this a whole fruit tea! Now, you want to talk about large fruit pieces? The fruit pieces in this tea are massive...King Kong size. Indeed, you could probably play baseball with some of these pieces...they are simply that big! 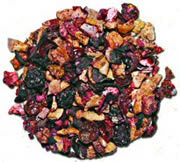 This tea from Culinary Teas contains the following ingredients : Hibiscus petals, Rosehip chips, Apple pieces, sweet orange peel, strawberry pieces, lemon peel, blackberries, raspberries, pineapple pieces, natural flavor. Here is how Culinary Teas describes this tea on their website : "We formulated this blend to accommodate tastes of people who wanted to experience a refreshing healthy new style drink without caffeine. What we got was a terrific ‘tea’ that is unbelievably delicious and enjoyed Hot or Cold! This tea has a very exotic flavor profile.The delicious blend of lemon and strawberry flavors combined with the natural flavors and tartness of the various dried fruits create a summertime cooler or a winter time summer reminder." The flavor of the tea, once brewed, is ALL strawberry. Supposedly there is a blackberry taste in it. Well, I'll take Culinary Teas at their word on that one. But, at least to me...this was what a strawberry tea should taste like. Indeed, I've never had a tea that tasted so similar to a strawberry straight off the vine as this one. As this is a herbal tea, there is no caffeine. You also can't overbrew this tea either...indeed, for a strong strawberry taste, brew this tea for a full 7 minutes, and perhaps even a bit longer too. Being a whole fruit herbal tea, there is also no danger of bitterness, either. Overall, this tea is a strawberry lovers delight. If you love strawberries, and have been searching the world over for a tea that tasted similar to a strawberry right off the vine, well...this tea is for you. Recommendation : Absolutely. If you love strawberries, then quite simply, this tea is for you. Period. End of Story.